A climbing or trailing shrub, with brilliant flowers, set off by bright green leaves, thin in texture, with pale "bloom" on the under side and. usually hairy margins, the lower ones with short leafstalks, the upper usually united and forming a disk. The flowers are scentless, about an inch and a quarter long, with smooth, trumpet-shaped corollas, bright orange at base, shading to scarlet above, with a bright green stigma and crimson or brownish anthers. This lives in the woods and sometimes climbs to the tops of quite tall trees, ornamenting them with its splendid clusters of flowers .and sprinkling the forest floor with its fallen blossoms in a shower of scarlet and gold. 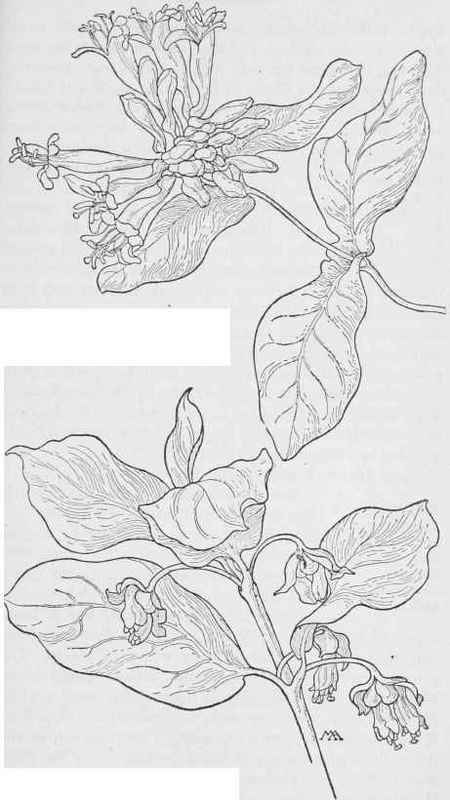 Orange Honeysuckle-L.ciliosa. Black Twinberry-Lonicera involucrakta. HONEYSUCKLE FAMILY. Caprifoliaceae.